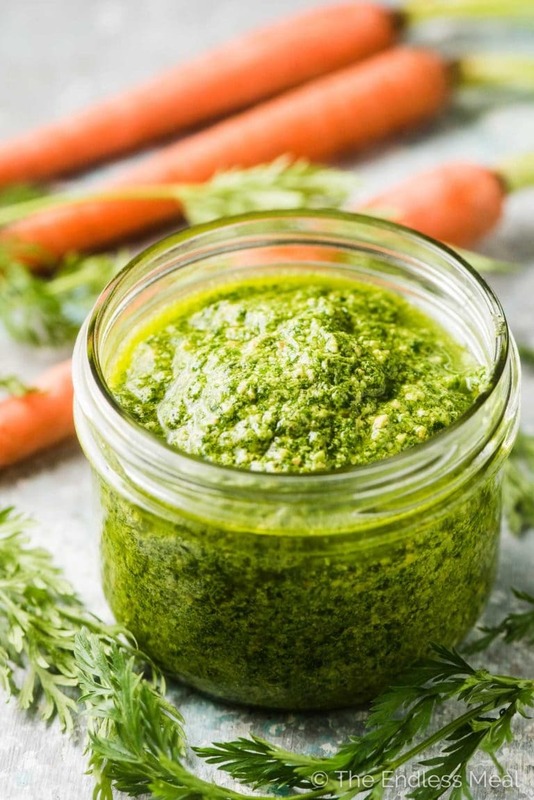 Carrot Top Pesto is easy to make and super delicious. 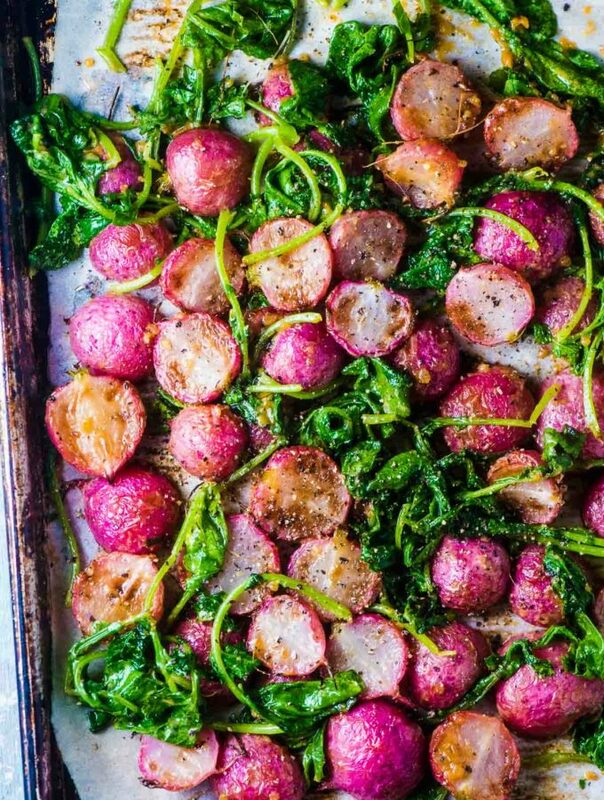 It's the best way to use all the pretty spring carrots with the greens on top! 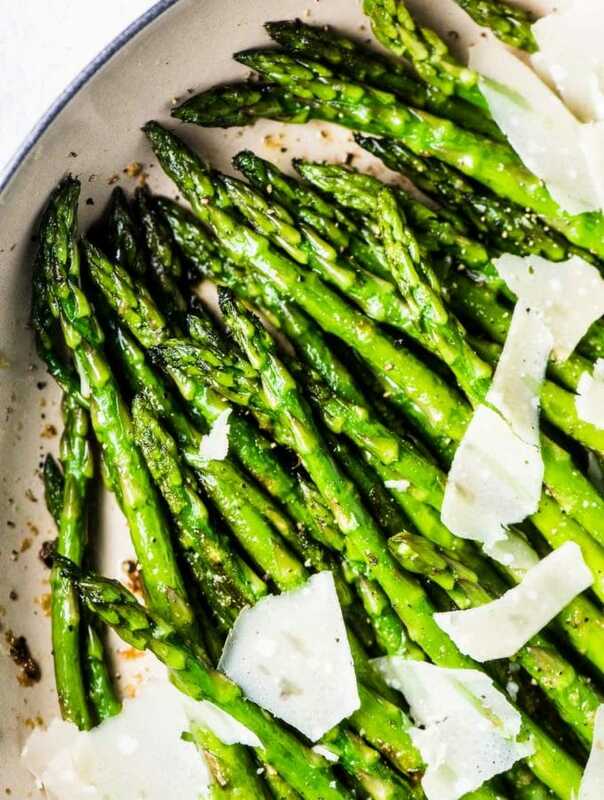 This is one of my favorite spring recipes. I shared it with you years ago but thought that the pictures could use a little updating. And it was a great excuse to make another batch of carrot top pesto. Did you know that carrot tops are edible? When I found that out I started putting them in salads and even sauteeing them. 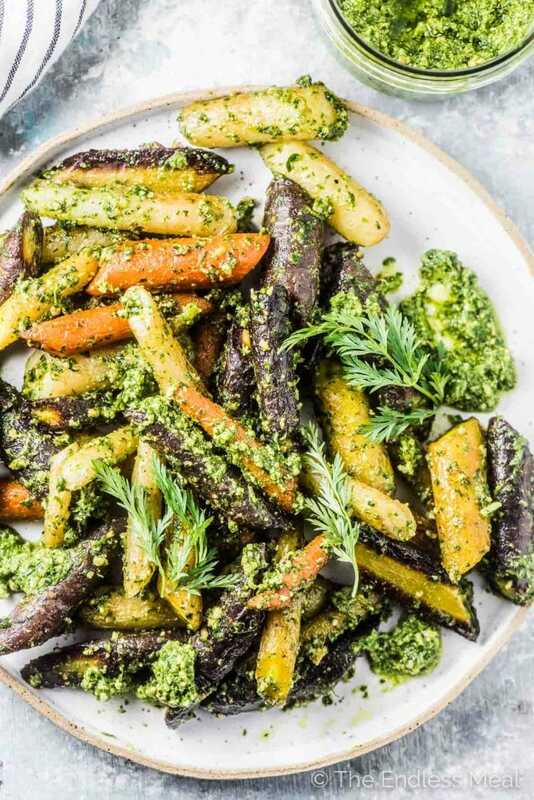 This carrot top pesto lets them shine. The pesto is vibrant colored and so delicious. 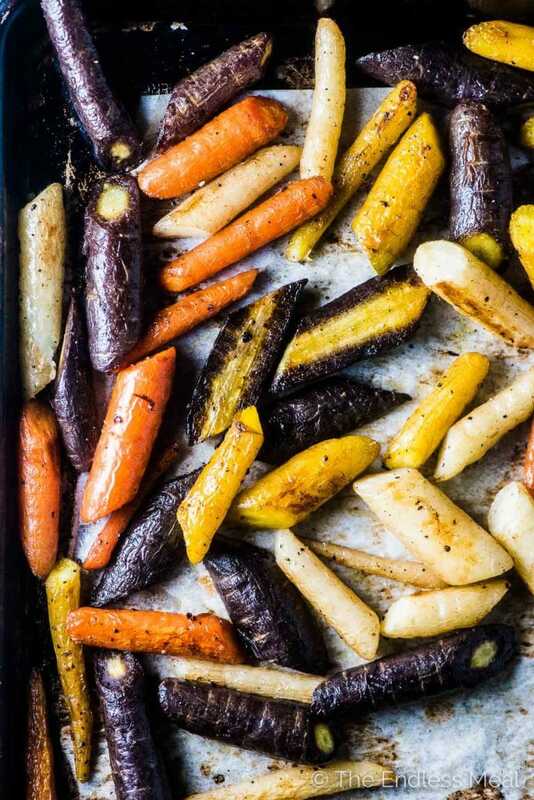 It's perfect for roast carrots and any leftovers (haha!) can be served with eggs, slathered on sandwiches, or tossed with pasta. Or at least I think those are all great ideas. We always pile the carrot top pesto thick on top of carrots and anything else we're eating for dinner. It's too good not to eat it all at once. The best damn pesto ever! Seriously, it's so good. This recipe is similar to basil pesto only it uses carrot tops instead of basil. And since I use super creamy and flavorful toasted cashews, there is no need to add any parmesan to this recipe. I promise you that you won't miss it! Which makes this carrot top pesto vegan + paleo + Whole30. 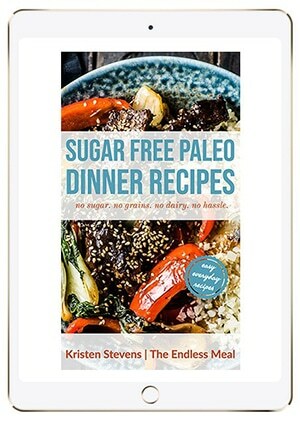 Give it up for healthy recipes that are DELICIOUS! This recipe is super easy. Simply add the ingredients to a food processor or small blender and blend them until mostly smooth. Voila! 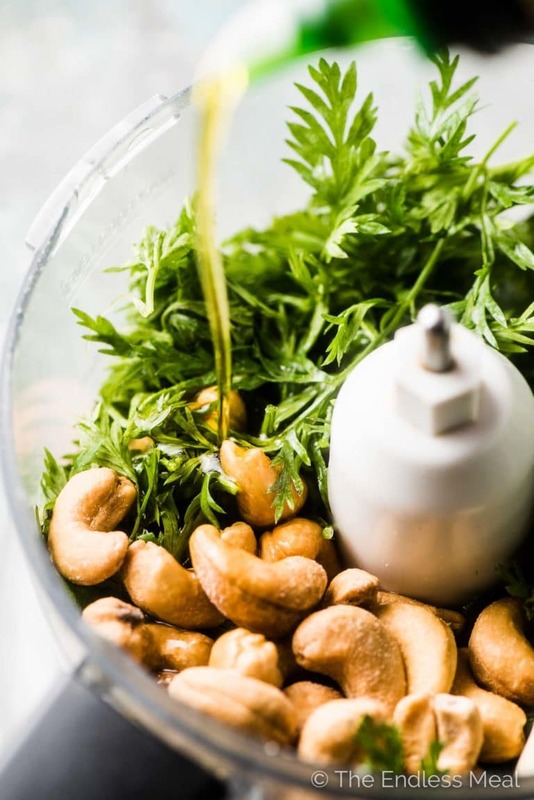 Traditional pesto calls for pine nuts, but I make this carrot top pesto with toasted cashews instead. They are very creamy (like pine nuts) and a much more affordable option. Plus, the nutty flavor they give the pesto takes it over the top. It's so good! How long will this pesto keep? 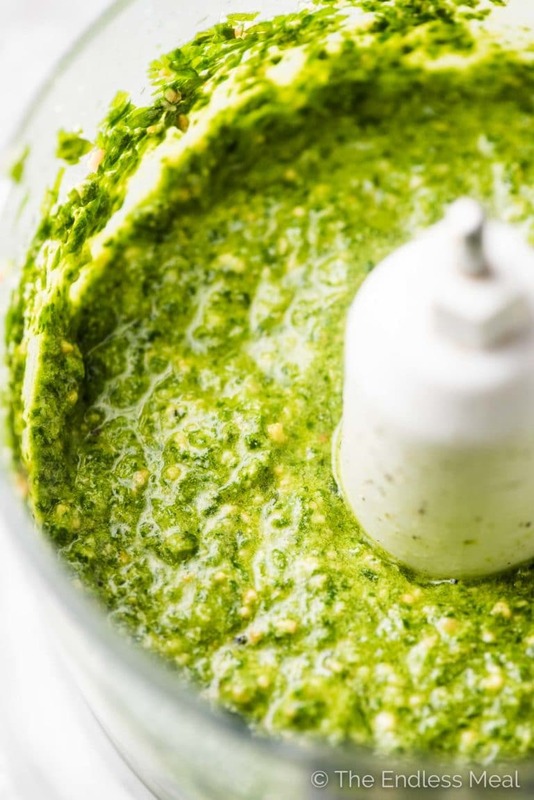 Carrot top pesto, like all pesto, is best eaten fresh. But you can store leftovers for 3-4 days in your fridge. 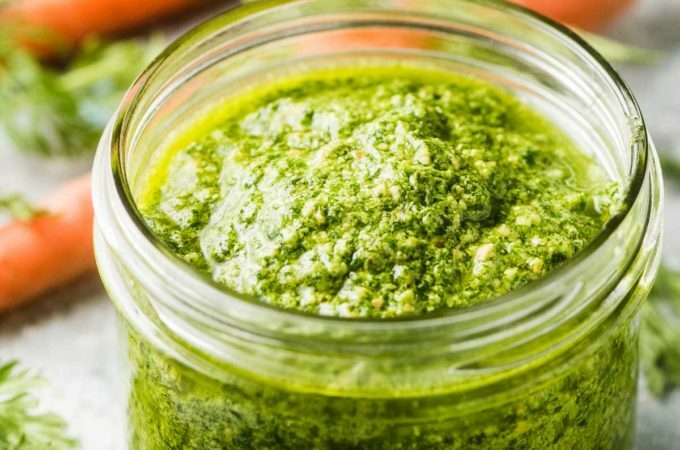 This pesto is SO GOOD! Honestly one of the best pesto I’ve ever made. I’m only going to buy carrots with tops from now on! Yay! I’m so happy to hear the recipe was a hit! i am that kid in the candy store too 😛 on a side note- i made pesto last night with basil and substituted cashew nuts with Parmesan cheese – extremely good pesto.